Many older homes and businesses built and wired in the early 1900s were wired with "grounded" electrical systems that have no grounding wire. You may have encountered these older electrical systems in a building where the electrical outlets only had "two-prong" plugs. There is a hot wire running to the outlet and a grounded wire from the outlet back to the breaker box in these electrical systems. There is no grounding wire in these systems. 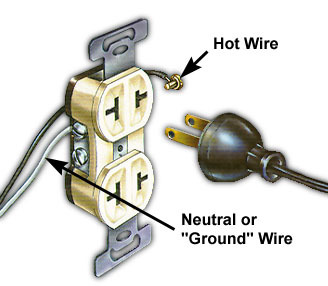 Today, building and wiring codes, including the National Electrical Code, recognize the need for grounding wires and require them to be installed during remodeling projects or new construction. The older systems that contain no grounding conductor are sometimes referred to as "un-grounded systems." This means they contain a white, insulated grounded conductor but no bare or green grounding conductor.